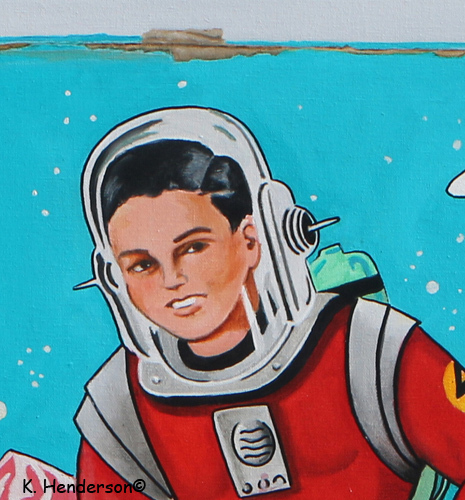 This is a detail of my painting Steve Scott Space Scout. The painting will be shown at CK Contemporary Gallery. Space Exploration. It was a busy time in the 1950’s and our pop culture reflected it. 1952 — Two Capuchin monkeys, Pat and Mike, and a pair of mice successfully recovered following a flight to 36 miles launched from Holloman Air Force Base. 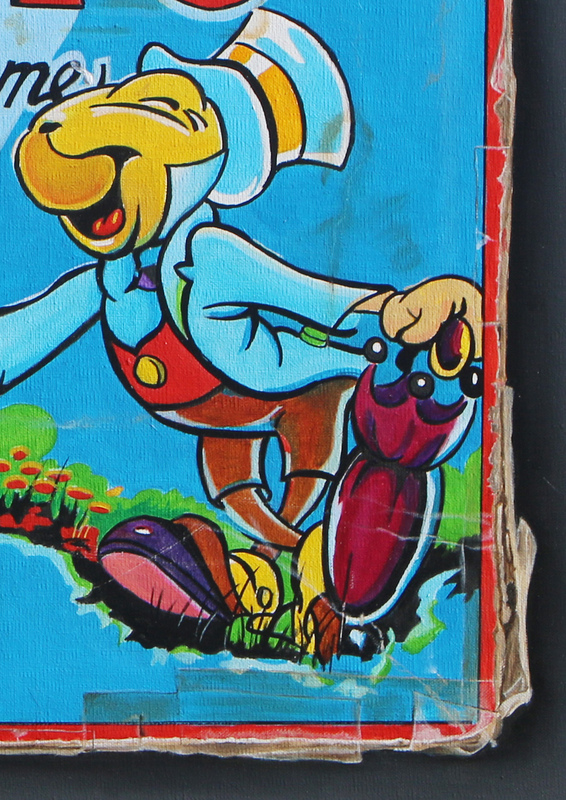 This is a detail of my painting The Mouse. The painting will be shown at CK Contemporary Gallery. Show Opening May 16. This Mickey Mouse card game was manufactured around 1946 and was included in a ‘six pack’ of other card games. The box measures 2.75″ x 1.875″. I love the old yellowed tape and the beat up edges. Mickey Doesn’t mind. He just keeps on smiling. 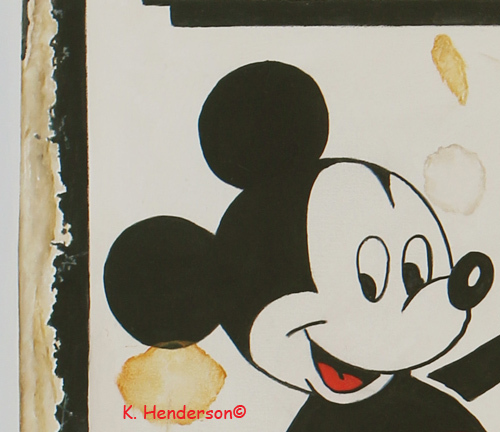 Did you know that Mickey Mouse had his 86th birthday in 2014? This is “school crayon” No. 019 made by American Pencil Company New York in 1936. One side of the box depicts Buck and Wilma looking through a porthole . 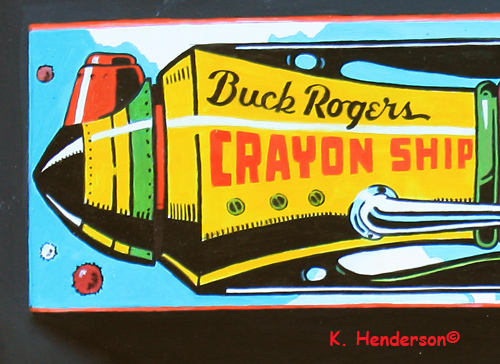 The opposite side depicts “Buck Rogers Crayon Ship” with die-cut square on right where pencils are visible and completes the ship design. The box contains six multi-colored pencils. The ‘chalk drawings’ (yes, these are painted with oil paint) are also based on the graphics from this box. This tin wind up toy represents one of the crows from the 1941 Disney animated film Dumbo.The toy was produced eight years after the film’s release to correspond with its 1949 re-release. It was produced in Japan, but under the Marx Toys. This vintage toy is one of my favorites and has a place of honor on my desk next to my easel. 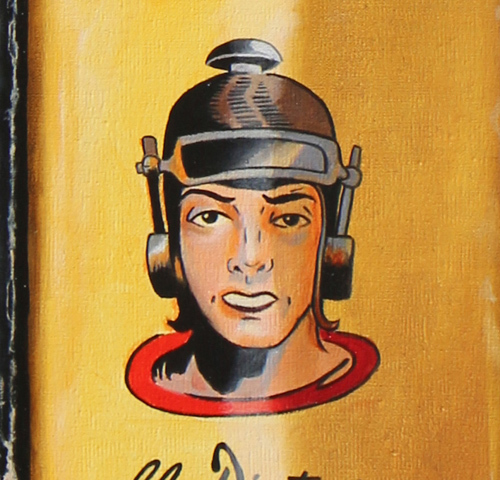 This is a detail of my painting Buck Rogers Bookst. The painting will be shown at CK Contemporary Gallery. I love books. I collect books. I have lots of books. Oddly enough, I rarely have books in my paintings. 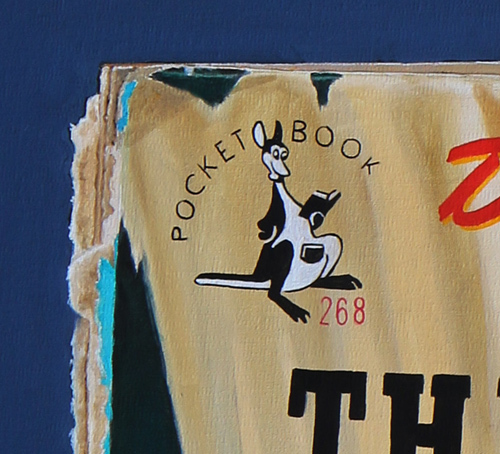 As a first step in remedying the situation I gathered up my Buck Rogers Big Little Books for this painting. Buck Rogers first appeared in Phil Nowlan’s science fiction tale titled Armageddon—2419, published in Amazing Stories in August of 1928. The Big Little Books were published between 1933 – 1943. Wonder Woman is not technically a Super Hero because she has no Super Powers. She’s just your ever day Amazonian who is as Beautiful as Aphrodite, as Strong as Hercules, as Wise as Athena and as Swift as Mercury. 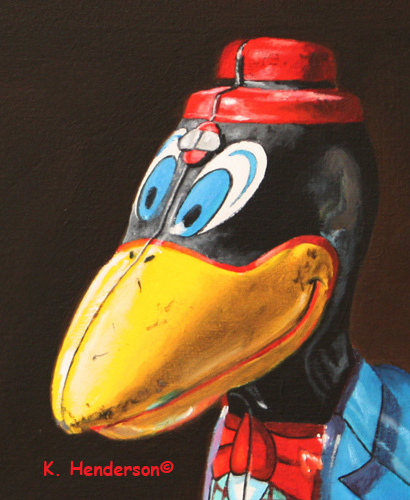 This is a detail of my painting Maltese Falcon. The painting will be shown at CK Contemporary Gallery. Show opens May 21. This painting is my homage to San Francisco. The iconic hard-boiled detective, Sam Spade still lives on in the City by the Bay. The Maltese Falcon is a 1929 detective novel by Dashiell Hammett, originally serialized in the magazine Black Mask beginning with the September 1929 issue.In 1998, the Modern Library ranked The Maltese Falcon 56th on its list of the 100 best English-language novels of the 20th century. This is a detail of my painting Batman Game. The painting will be shown at CK Contemporary Gallery. Show opens May 16. 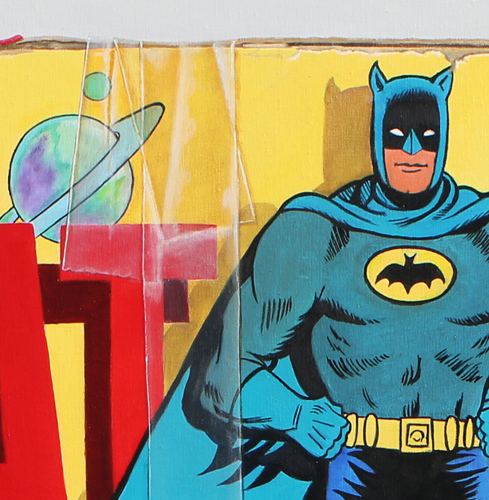 This 1966 board game by Milton Bradley is based on the Batman television show starring Adam West as Batman and Burt Ward as Robin. The box shows Batman, Robin, The Joker, Blockbuster, the Batmobile and spaceships. Spaceships?? The object of the game is to be the first player to capture six different Villains. 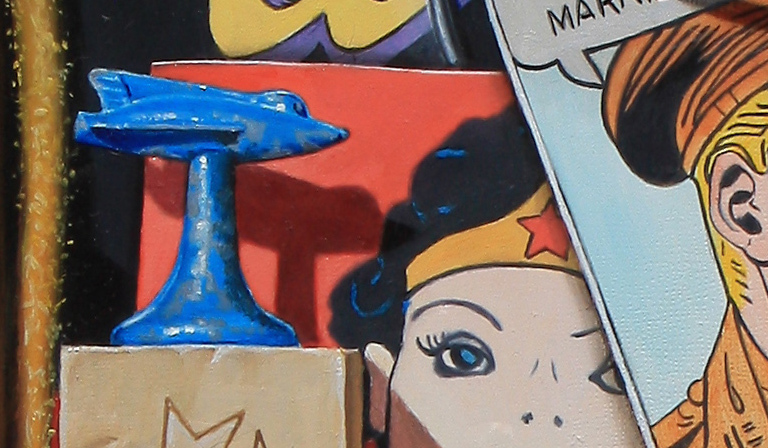 This is a detail of my painting The Merry Puppet. 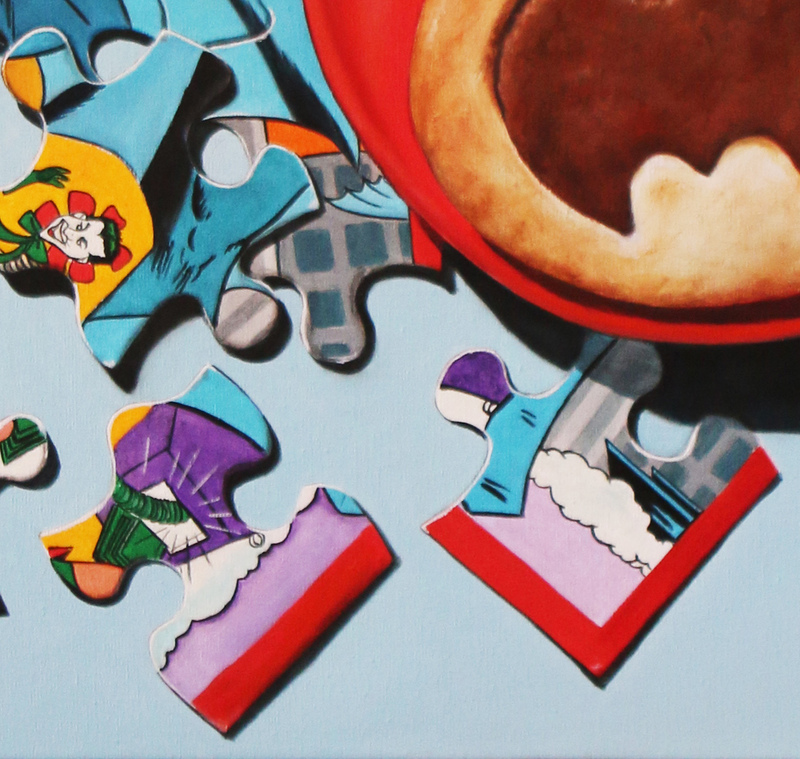 The painting will be shown at CK Contemporary Gallery. The Adventures of Pinocchio written by Carlo Collodi 1883 is one of the creepiest children’s stories I’ve ever read. I love it! The mild Walt Disney movie animation was released in theaters in 1940. It was initially a box office disaster. In 1939 Milton Bradley created this board game based on Disney’s motion picture.The box top depicts images of Pinocchio and his protector Jiminy Cricket.